After making an impressive start to life as interim Man Utd boss, Ole Gunnar Solskjaer has hinted that he could get January reinforcements from the club. The Norwegian tactician replaced Jose Mourinho at the helm at Old Trafford last month, and has since guided the Red Devils to four consecutive wins. In that run of good form they’ve scored 14 goals and conceded three, and so it appears as though he has found solutions to their main problems for now. That in turn has ensured that they’re back in the hunt for a top-four finish in the Premier League this season, as they sit just six points adrift of Chelsea after 21 games. 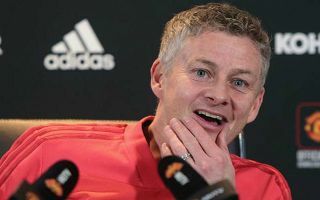 Perhaps having now proven that he’s capable of achieving their minimum objective of securing Champions League qualification, Solskjaer has revealed that he could hold talks with United chief Ed Woodward about potential January signings. “I am sure they have got plans for this transfer window,” Solskjaer said, as per Sky Sports. “The club has probably had a plan since the summer and the year before. “I am here to voice my opinion on that and I am sure we will sit down, me and Ed, if they have got anything in the pipeline. Time will tell if reinforcements do arrive to help Solskjaer and his current group in the second half of the season, but it’s also likely that any major additions will surely only be made in the summer when a long-term appointment is secured so that they can have their input into what is needed to fit their ideas. Nevertheless, based on United’s form under his stewardship thus far, it could be argued that Solskjaer deserves to have a say in who might potentially arrive at Old Trafford this month as his methods and ideas are certainly working for now.